Sustaining payments and late nominations for the 2018 Grade 1 Texas Classic Futurity and Derby are due Sunday, April 15. ELGIN, TX—APRIL 9, 2018—Sustaining payments for the 2018 $1 million-est. Grade 1 Texas Classic Futurity and $400,000-est. 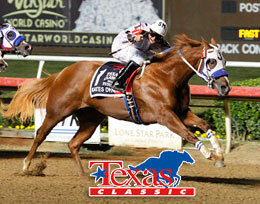 Grade 1 Texas Classic Derby are due Sunday, April 15. TQHA has reported that 329 two-year-olds nominated for the 2018 Texas Classic Futurity and 110 three-year-olds have been nominated for the 2018 Texas Classic Derby. Owners must pay $400 to sustain their nominations to both races on or before the April 15 deadline. Late nominations can made for $1000 plus payments to day ($2,250). $1,200+ all fees due at Time of Entry to Lone Star Park. $50,000 supplemental nominations. For additional information contact the TQHA office at 512-458-5202 or visit the association's website at tqha.com.